CHEF’S TABLE: Every Wednesday 5-9:00 p.m. Dine al fresco on Wednesdays at Bella Vista Restaurant for an interactive three-course dining experience that is sure to be a family favorite. Enjoy the culinary craftsmanship of Executive Chef Marco Fossati as he prepares your main course with fresh, local ingredients. Make your reservation between 5 pm and 6 pm to experience the cooking process from start to finish. Call 565-8237 for reservations or more information. 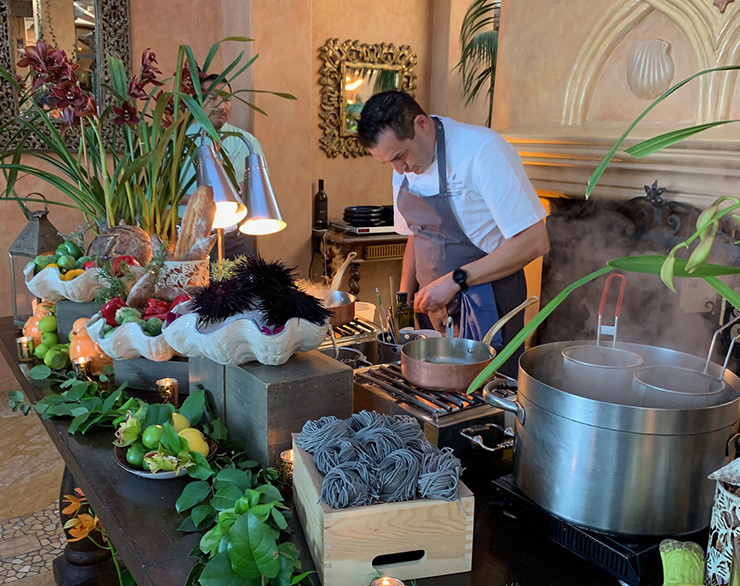 SATURDAY BRUNCH: You have likely heard about the popular Sunday brunch at the Biltmore, that has been a feature of the resort for decades, but I bet you didn’t know that they have a new Saturday Brunch, because it was just launched two weeks ago. Starters include 1/2 Dozen Oysters, Ahi Tuna Tartare, Crudo of the Day, Lobster Caprese , Red Bell Pepper Hummu, Classic Beef Tartare, and Farmers Market Salad, ranging in price from $14-$26. The Brunch Classics menu offers Lemon Ricotta Pancake, Buttermilk Fried Chicken & Waffle, Carbonara, Chilaquiles, Steak and Egg, Bella Vegan,and Crab Eggs Benedict ranging in price from $21-$27. If you would like to end the feast with something sweet try Heather’s Bread & Butter Pudding, Chef’s Lemon Tart, “Affogato Al Caffe, ” Overnight Oats “Sundae,” or the Chocolate and Red Wine Lava Cake. The Restaurant Gal and I enjoyed the lobster, Ahi Tuna, pancakes, and the Eggs Benedict, along with some made-from-scratch virgin Blood Marys. I can’t say I have had a better one. View Saturday Brunch menu details at tinyurl.com/biltmorebrunch.